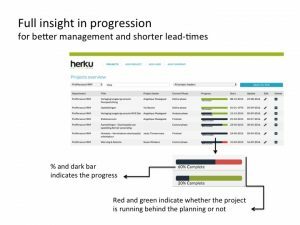 HerkuLess® – online Lean Six Sigma project tool. Discover the unique combination of project structure, data analysis and on-demand training. Are you responsible for a department or a company? Then you want to know which projects are running, who is involved in them and what is the current situation. Often it is already a challenge to get an overview with information about all projects, committees and working groups. If you are not careful, you may end up spending a lot of time and attention at projects and meetings that are not important. How can you finish a project in time and successful? You want to have insight in the status of the project. Is the team working as planned, or are they behind? If you don’t manage well, the project might take twice as long or cost twice as much. Is the project scope not to wide? Is the problem clear? What is the next step? All these questions indicate potential risks for delay, causing a way too long lead-time. This will demotivate the team and lead to unsatisfying results. In HerkuLess® problem statements and objectives are automatically pre-defined on the basis of many years of experience with improvement projects. Project Definition and formulation of SMART objectives won’t be seen as very time consuming by the team anymore. 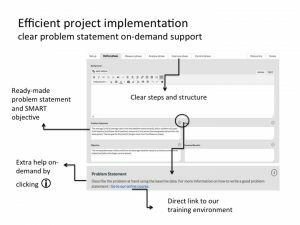 The clear, modular design of the project application makes clear what steps need to be carried out and in what order. With the direct link to our online Lean Six Sigma training environment you can obtain, when necessary, immediate explanation about specific parts of the project. You can use this when you are not sure what to do, but also to get more insight or background information. Has the project gone well, but there are no concrete outcomes? 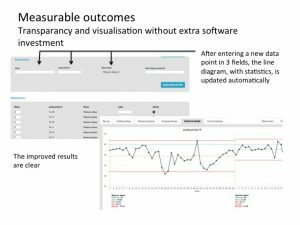 Are the data not well accessible or presented because there is little knowledge of MS Excel or no money has been invested in statistical software like Minitab®? HerkuLess® provides a simple data entry interface which helps you to automatically visualise and statistically describe data, including in calculations such as averages and process limits. ware like MS Excel or Minitab®. Each project team member can enter data in the project. Results are immediately displayed for all project members to see. Why should you choose this product instead of another one? There are many good project planning software out there but very few focusing on Lean Six Sigma project management and execution. HerkuLess® goes even further by structuring for you only the 20% most effective tools that solves 80% of your problems. All the other tools and techniques are left out because you do not need them. Can I use other statistical tools not included in HerkuLess®? No problem. You can still run your MSA or ANOVA-test or DOE’s using Minitab® and attach the documents in HerkuLess®. Running hundreds of Lean and Six Sigma projects in all kinds of industries, we concluded that if you want to empower employees with practical tools so they can improve themselves and able to contribute in projects, you need to keep Lean Six Sigma simple and effective. The set of tools that are included in HerkuLess® gives you that. How does coaching and support work? For plans PRO and PREMIUM we help you from the start by selecting the right project, choosing the most appropriate KPI (performance indicator) and we follow your progress. We agree on a coaching schedule and discuss your issues to make sure you waste no time. In case you have a question between coaching sessions, you can send us an email or call and we come back to you with our solutions. 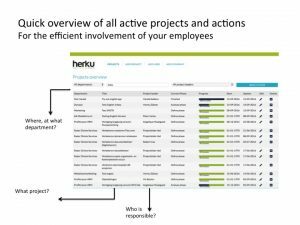 Starting from plan PRO we guarantee that the money you invest with HerkuLess® will be returned to you by the achieved savings of your projects – when you use the tool as designed and follow up on our advice. By plan PRO the annualised savings would at least cover the costs of HerkuLess®. By PREMIUM plan annualised savings guaranteed to amount 5 times the investment with HerkuLess®. Don’t see your question? Feel free to contact us.